Japanese Prime Minister Shinzo Abe got a shot in the arm with his ruling coalition winning a new two-thirds majority in the elections held on Sunday. The win, in which Abe’s Liberal Democratic Party (LDP) retained its majority in the House of Representatives, is seen as a referendum on his economic policy, known as Abenomics. LDP and its coalition partner Komeito party have together won 325 seats (LDP 290 seats, Komeito 35), two-thirds of the total of 475. The main opposition party, the Democratic Party of Japan, won 73 seats. Abe had called for snap polls after Japan drifted into recession as his economic policy, which is based on heavy public spending and sustained stimulus programme, failed to sustain its early success. While his economic policy, known as Abenomics, has a long-term strategy to lift Japan’s flaccid economy through various measures, the move to increase sales tax from 5 per cent to 8 per cent in April this year effected opposite results. Consumer spending dipped and the country witnessed two consecutive quarters of negative growth, resulting in recession. Even though Abe has been re-elected, his win has been marred by low voter turnout and criticism that the snap polls were unnecessary and a sheer waste of money. 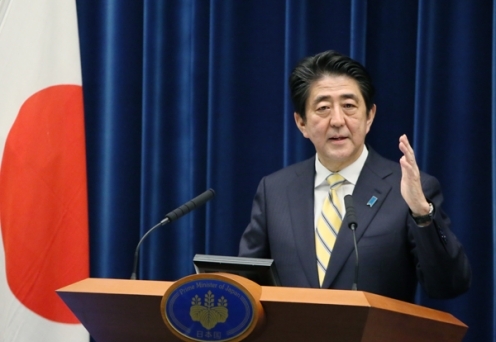 Abe was only halfway through his four-year term when he sought fresh mandate. According to Abe’s original plan, the sales tax was supposed to be increased yet again to 10 per cent in 2015. However, according to experts, he’s likely to delay that plan considering the state of the economy.